“Slava”, or formally, Dr. V. M. Shostakovsky, was an organic chemist in the Zelinsky Institute of Organic Chemistry in Moscow. His father was a well-known chemist and had won prizes in chemistry. They were, shall we say, privileged, because they were allowed to own non-Russian guns. At the time this was Verboten! He also visited the U. S. in the early 1980’s and was a visiting professor at the University of Minnesota-Duluth Campus. So you see, I have more than a passing interest in Scolopax! The two feathers are among my treasured possessions and I wondered if our Scottish friend saves these feathers too? 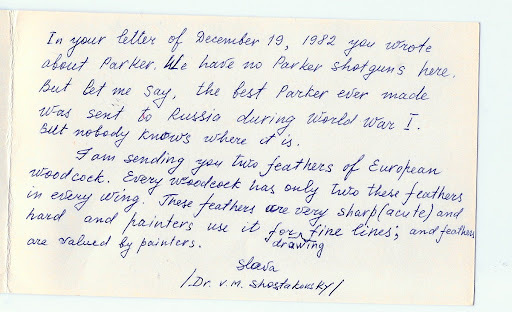 As an interesting aside, note his comments re: the Parker Shotgun that was built for the Czar. Apparently, it has resurfaced after many years. Please check this link http://tinyurl.com/csx5n6 for information on the auction sale last year to Jack Puglisi of Duluth, Minnesota. 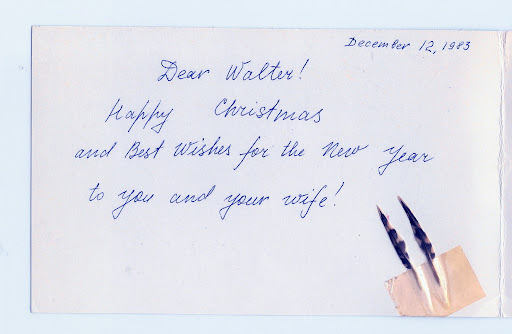 Interesting tangential connection between the gun, my note from “Slava” of 26 years ago and Duluth! Random, I am sure. Or fate? Who knows? Just the ramblings of an old-timer. That’s pretty cool! I love the history! I remember reading about that Parker…not to long ago as I recall!